*Note: The focus of this biography is on Gandhi's life and times in South Africa. Mohandas Karamchand Gandhi was born to a Hindu family on 2nd October 1869, in Porbandar, Gujarat, India. He was the last child of Karamchand Gandhi, his father and his father's fourth wife Putlibai. His father belonged to the merchant caste and he was a lawyer,an important government official.His early schooling was in nearby Rajkot, where his father served as the adviser or prime minister to the local ruler. India was then under British rule. His father died before Gandhi could finish his schooling. At thirteen, the young Gandhi was married to Kasturba [or Kasturbai], who was of the same age as himself. She bore him four sons. In September 1888 Gandhi set sail for England, to pursue a degree in law. Gandhi left behind his son Harilal, then a few months old. He spent three years stay in London being a serious student, living a very simple lifestyle. He became deeply interested in vegetarianism and study of different religions. His stay in England provided opportunities for widening horizons and better understanding of religions and cultures.Through meeting local vegetarians he had also develop an interest in books on philosophy,particularly those by Leo Tolstoy,John Ruskin and Henry David Thoreau. Gandhi arrived in Durban, Natal (now kwaZulu-Natal) in 1893 to serve as legal counsel to a merchant Dada Abdulla. In June, Dada Abdulla asked him to undertake a rail trip to Pretoria, Transvaal, a journey which first took Gandhi to Pietermaritzburg, Natal. There, Gandhi was seated in the first-class compartment, as he had purchased a first-class ticket. A White person who entered the compartment hastened to summon the White railway officials, who ordered Gandhi to remove himself to the van compartment, since 'coolies' (a racist term for Indians) and non-whites were not permitted in first-class compartments. Gandhi protested and produced his ticket, but was warned that he would be forcibly removed if he did not make a gracious exit. As Gandhi refused to comply with the order, a White police officer pushed him out of the train, and his luggage was tossed out on to the platform. The train steamed away, and Gandhi withdrew to the waiting room. "It was winter," Gandhi was to write in his autobiography, and "the cold was extremely bitter. My overcoat was in my luggage, but I did not dare to ask for it lest I should be insulted again, so I sat and shivered". He says he began to think of his "duty": ought he to stay back and fight for his "rights", or should he return to India? His own "hardship was superficial", "only a symptom of the deep disease of colour prejudice." The next evening he continued the train journey-this time without a mishap. But a bigger mishap awaited him on the journey from Charlestown to Johannesburg which had to be covered by stagecoach. He was made to sit with the coachman on the box outside, while the white conductor sat inside with the white passengers.Gandhi pocketed the insult for fear of missing the coach altogether. On the way the conductor who wanted a smoke spread a piece of dirty sack-cloth on the footboard and ordered Gandhi to sit there so that the conductor could have Gandhi's seat and smoke. Gandhi refused. The conductor swore and rained blows on him, trying to throw him down. Gandhi clung to the brass rails of the coach box, refusing to yield and unwilling to retaliate. Some of the White passengers protested at this cowardly assault and the conductor was obliged to stop beating Gandhi who kept his seat. The position of Indians in the Transvaal was worse than in Natal. They were compelled to pay a poll tax of £3; they were not allowed to own land except in specially allotted locations, a kind of ghetto; they had no franchise, and were not allowed to walk on the pavement or move out of doors after 9 p.m. without a special permit. One day Gandhi, who had received from the State Attorney a letter authorizing him to be out of doors all hours, was having his usual walk. As he passed near President Kruger's house, the policeman on duty, suddenly and without any warning, pushed him off the pavement and kicked him into the street. A Mr. Coates, an English Quaker, who knew Gandhi, happened to pass by and saw the incident. He advised Gandhi to proceed against the man and offered himself as witness. But Gandhi declined the offer saying that he had made it a rule not to go to court in respect of a personal grievance. During his stay in Pretoria, Gandhi read about 80 books on religion. He came under the influence of Christianity but refused to embrace it. During this period, Gandhi attended Bible classes.Within a week of his arrival there, Gandhi made his first public speech making truthfulness in business his theme. The meeting was called to awaken the Indian residents to a sense of the oppression they were suffering under. He took up the issue of Indians in regard to first class travel in railways. As a result, an assurance was given that first and second-class tickets would be issued to Indians "who were properly dressed". This was a partial victory.These incidents lead Gandhi to develop the concept of Satyagraha. He united the Indians from different communities, languages and religions, who had settled in South Africa.By the time Gandhi arrived in South Africa the growing national- perpetuated by the White ruling authorities and the majority of the White citizenry - anti-Indian attitude had spread to Natal (now kwaZulu-Natal). The first discriminatory legislation directed at Indians, Law 3 of 1885, was passed in the South African Republic, or the Transvaal. The right to self-government had been granted to Natal in 1893 and politicians were increasing pressure to pass legislation aimed at containing the 'merchant [Indian] menace'. Two bills were passed in the following two years restricting the freedom of Indians severely. The Immigration Law Amendment Bill stated that any Indian had to return to India at the end of a five-year indenture period or had to be re-indentured for a further two years. If he refused an amount of £3 annual tax had to be paid. The bill came into law in 1895. A Franchise Amendment Bill was introduced in 1894. It was designed to limit the franchise to Indians who had the vote. Although there were only 300 of them, in comparison to 10 000 white voters, the Bill caused outrage among Indian leadership. They decided to contest the measure by any means available to them.Having completed his work in Pretoria, Gandhi returned to Durban and prepared to sail home. At a farewell dinner, in April 1894, given in his honour someone showed him a news item in the Natal Mercury that the Natal Government proposed to introduce a bill to disfranchise Indians. Gandhi immediately understood the ominous implications of this bill which, as he said, "is the first nail into our coffin" and advised his compatriots to resist it by concerned action. But they pleaded their helplessness without him and begged him to stay on for another month. He agreed little realizing that this one month would grow into twenty years. Gandhi immediately turned the farewell dinner into a meeting and an action committee was formed. This committee then drafted a petition to the Natal Legislative Assembly. Volunteers came forward to make copies of the petition and to collect signatures - all during the night. The petition received much favourable publicity in the press the following morning. The bill was however passed. Undeterred, Gandhi set to work on another petition to Lord Ripon, the Secretary of State for Colonies. Within a month the mammoth petition with ten thousand signatures was sent to Lord Ripon and a thousand copies printed for distribution. Even The Times admitted the justice of the Indian claim and for the first time the people in India came to know of the oppressive lot of their compatriots in South Africa. Gandhi insisted that if he had to extend his stay in South Africa he would accept no remuneration for his public services and since he still thought it necessary to live as befitted a barrister he needed about £300 to meet his expenses. He therefore enrolled as an advocate of the Supreme Court of Natal. On 25 June 1894, at the residence of Sheth Abdulla, with Sheth Haji Muhammad, the foremost Indian leader of Natal in the chair, a meeting of Indians was held and it was resolved to offer opposition to the Franchise Bill. Here Gandhi outlined his plan of action to oppose this bill.Gandhi played a prominent role in the planned campaign. As a talented letter-writer and meticulous planner, he was assigned the task of compiling all petitions, arranging meetings with politicians and addressing letters to newspapers. He also campaigned in India and made an, initially, successful appeal to the British Secretary of State for the Colonies, Lord Ripon. He was instrumental in the formation of theNatal Indian Congress (NIC) on 22 August 1894, which marked the birth of the first permanent political organisation to strive to maintain and protect the rights of Indians in South Africa. By 1896 Gandhi had established himself as a political leader in South Africa. In this year, he undertook a journey to India to launch a protest campaign on behalf of Indians in South Africa. It took the form of letters written to newspapers, interviews with leading nationalist leaders and a number of public meetings. His mission caused great uproar in India and consternation among British authorities in England and Natal. Gandhi embarrassed the British Government enough to cause it to block the Franchise Bill in an unprecedented move, which resulted in anti-Indian feelings in Natal reaching dangerous new levels.While in India, an urgent telegram from the Indian community in Natal obliged him to cut short his stay. He set sail for Durban with his wife and children on 30 November 1896. Gandhi did not realize that while he had been away from South Africa, his pamphlet of Indian grievances, known as the Green Pamphlet, had been exaggerated and distorted. When the ship reached Durban harbour, it was for held for 23 days in quarantine. The European community, misled by garbled versions of Gandhi’s activities in India and by a rumour that he was bringing shiploads of Indians to settle in Natal, were wild with anger and threatened to drown all the passengers. News of this cowardly assault received wide publicity and Joseph Chamberlain, the British Secretary of States for the Colonies, cabled an order to Natal to prosecute all those who were responsible for the attempted lynching. 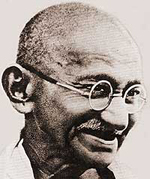 However, Gandhi refused to identify and prosecute his assailants, saying that they were misled and that he was sure that when they came to know the truth they would be sorry for what they had done.It was during this second period in South Africa that Gandhi’s underwent a gradual change. Previously he was anxious to maintain the standard of an English barrister. Now he began, to methodically reduce his wants and his expenses. He began to do his own laundry and clean out his own chamber-pots but often his guests as well.Not satisfied with self-help, he volunteered, despite his busy practice as a lawyer and demand of public work, his free service for two hours a day at a charitable hospital. He also undertook the education at home of his two sons and a nephew. He read books on nursing and midwifery and in fact served as midwife when his fourth and last son was born in Natal. In 1899 the Second Anglo-Boer (South African War) war broke out. Though Gandhi’s sympathies were with the Boers who were fighting for their independence, he advised the Indian community to support the British cause, on the ground that since they claimed their rights as British subjects, it was their duty to defend the Empire when it was threatened. He organized and, with the help of a Dr. Booth, trained an Indian Ambulance Corps of 1,100 volunteers and offered its services to the Government. The corps under Gandhi’s leadership rendered valuable service and was mentioned in dispatches.In 1901, at the end of the war, Gandhi wanted to return to India. His professional success in South Africa might, he feared turn him into a “money-maker”. With great difficulty he persuaded his friends to let him go and promised to return should the community need him within a year.He reached India in time to attend the Calcutta session of the Indian National Congress and had the satisfaction of seeing his resolution on South Africa pass with acclamation. He was however disappointed with the congress. He felt that Indian politicians talked too much but did little.Hardly had he set up in practice in Bombay when a cablegram from the Indian community in Natal recalled him. He had given them his word that he would return if needed. Leaving his family in India he sailed again. He had been called to put the Indian case before Joseph Chamberlain who was visiting South Africa. But the Colonial Secretary who had come to receive a gift of thirty-five million pounds from South Africa had no intention to alienate the European community. Gandhi failed in his mission to win Chamberlain’s sympathy and discovered in the process that the situation in the Transvaal had become ominous for the Indians. He therefore decided to stay on in Johannesburg and enrolled as an advocate of the Supreme Court.Though he stayed on specifically to challenge White arrogance and to resist injustice, he harboured no hatred in his heart and was in fact always ready to help when they were in distress. It was this rare combination of readiness to resist wrong and capacity to love his opponent which baffled his enemies and compelled their admiration.When the Zulu rebellion broke out, he again offered his help to the Government and raised an Indian Ambulance Corps. He was happy that he and his men had to nurse the sick and dying Zulus whom the White doctors and nurses were unwilling to touch.Gandhi was involved in the formation British Indian Association (BIA) in 1903. The movement was to prevent proposed evictions of Indians in the Transvaal under British leadership. According to Arthur Lawley, the newly appointed Lieutenant Governor Lord Alfred Milner said that Whites were to be protected against Indians in what he called a 'struggle between East and West for the inheritance of the semi-vacant territories of South Africa'. Influenced by the Hindu religious book, the Bhagvad Gita, Gandhi wanted to purify his life by following the concepts of aparigraha (non-possession) and samabhava (equability). A friend gave him the book, Unto This Last, by John Ruskin; Gandhi became excited about the ideals proffered by Ruskin. The book inspired Gandhi to establish a communal living community called Phoenix Settlement just outside of Durban in June 1904. The Settlement was an experiment in communal living, a way to eliminate one's needless possessions and to live in a society with full equality. Gandhi moved his newspaper, the Indian Opinion , established in June 1903 and its workers to the Phoenix Settlement as well as his own family a bit later. Besides a building for the press, each community member was allotted three acres of land on which to build a dwelling made of corrugated iron. In addition to farming, all members of the community were to be trained and expected to help with the newspaper. In 1906, believing that family life was taking away from his full potential as a public advocate, Gandhi took the vow of brahmacharya (a vow of abstinence against sexual relations, even with one's own wife). This was not an easy vow for him to follow, but one that he worked diligently to keep for the rest of his life. Thinking that one passion fed others, Gandhi decided to restrict his diet in order to remove passion from his palette. To aid him in this endeavour, Gandhi simplified his diet from strict vegetarianism to foods that were unspiced and usually uncooked, with fruits and nuts being a large portion of his food choices. Fasting, he believed, would also help still the urges of the flesh.Gandhi believed that his taking the vow of brahmacharya had allowed him the focus to come up with the concept of Satyagraha in late 1906. In the very simplest sense, Satyagraha is passive resistance. However, Gandhi believed the English phrase of "passive resistance" did not represent the true spirit of Indian resistance since passive resistance was often thought to be used by the weak and was a tactic that could potentially be conducted in anger. Needing a new term for the Indian resistance, Gandhi chose the term "satyagraha," which literally means "truth force." Since Gandhi believed that exploitation was only possible if both the exploited and the exploiter accepted it, if one could see above the current situation and see the universal truth, then one had the power to make change. (Truth, in this manner, could mean "natural right," a right granted by nature and the universe that should not be impeded on by man. )In practice, Satyagraha was a focused and forceful nonviolent resistance to a particular injustice. A Satyagrahi (a person using Satyagraha) would resist the injustice by refusing to follow an unjust law. In doing so, he would not be angry, would put up freely with physical assaults to his person and the confiscation of his property, and would not use foul language to smear his opponent. A practitioner of Satyagraha also would never take advantage of an opponent's problems. The goal was not for there to be a winner and loser of the battle, but rather, that all would eventually see and understand the "truth" and agree to rescind the unjust law. On 28 December 1907 the first arrests of Indians refusing to register were made, and by the end of January 1908, 2000 Asians had been jailed. Gandhi had also been jailed several times, but many key figures in the movement fled the colony rather than be arrested. The first time Gandhi officially used Satyagraha was in South Africa beginning in 1907 when he organised opposition to the Asiatic Registration Law (the Black Act). In March 1907, the Black Act was passed, requiring all Indians - young and old, men and women - to get fingerprinted and to keep registration documents on them at all times. Gandhi advised the Indian community to refuse to submit to this indignity and to court imprisonment by defying the law. Indians refused to get fingerprinted and picketed the documentation offices. Mass protests were organised, miners went on strike, and masses of Indians travelled, illegally, from Natal to the Transvaal in opposition to the Black Act. Many of the protesters were beaten and arrested. In January 1908, he was arrested and sentenced to two months’ simple imprisonment. He was followed by other Satyagrahis. This was the first of Gandhi's many jail sentences. It took seven years of protest, before the Black Act was repealed in June 1914. Gandhi had proved that nonviolent protest could be immensely successful. The Indians made a bonfire of their registration certificates and decided to defy the ban on immigration to the Transvaal. Jails began to be filled. Gandhi was arrested a second time in September 1908 and sentenced to two months' imprisonment, this time hard labour. The struggle continued. In February 1909 he was arrested a third time and sentenced to three months' hard labour. He made such good use of his time in jail with study and prayer that he was able to declare that "the real road to ultimate happiness lies in going to jail and undergoing sufferings and privations there in the interest of one's own country and religion".Before the prison term was over General Jan Smuts sent him an emissary proposed that if the Indians voluntarily registered themselves he promised to repeal the Act. Gandhi and the leader of the Chinese population in South Africa, Leung Quin, agreed to the compromise. He always believed in trusting the opponent, but other Indians were not so trusting. One burly Indian, a Pathan, even charged Gandhi with having betrayed them and threatened to kill him if he registered. On the day Gandhi went out to register he was waylaid and attacked by this and other Pathans and severely injured. When he recovered consciousness and was told that his assailants had been arrested he insisted on them being released. Gandhi registered, but his disappointment was great when Smuts went back on his word and refused to repeal the Black Act along with denying any promises were made. The Indians made a bonfire of their registration certificates and decided to defy the ban. In June 1909, he left for London after having defended his position as leader of the Transvaal merchant community.Gandhi returned to South Africa in December 1909 to find that members of the NIC were openly plotting against him. He was fighting for his political survival and withdrew to Tolstoy, a farm he had purchased in 1910 to support the families of jailed passive resisters. Gandhi only came under the public eye again in 1912 as a result of a visit to South Africa by Indian statesman Gopal Krishna Gokhale. He was accused of preventing opponents of his policies to speak with the visitor and finally, on 26 April 1913 Gandhi and his rivals in the NIC went their separate ways. In 1911, a provisional settlement of the Asiatic question in the Transvaal brought about a suspension of the Satyagraha campaign. In the following year, Gokhale visited South Africa and on the eve of his departure assured Gandhi that the Union Government had promised to repeal the Black Act, to remove the racial bar from the immigration law and to abolish the £3 tax. But Gandhi had his fears which were soon borne out. The Union Government went back on its promise, and to this fire was added a very powerful fuel when a judgment of the Supreme Court ruled that only Christian marriages were legal in South Africa, turning at one stroke all Indian marriages in South Africa invalid and all Indian wives into concubines. This provoked Indian women, including, Kasturbai, to join the struggle.It was illegal for the Indians to cross the border from the Transvaal into Natal, and vice versa, without a permit. Indian women from the Tolstoy Ashram, which Gandhi set up in the Transvaal, crossed the border without permits and proceeded to Newcastle to persuade the Indian miners there to strike. They succeeded and were arrested. The strike spread and thousands of miners and other Indians prepared, under Gandhi's leadership, to march to the Transvaal border in a concerted act of non-violent defiance. On the 29th October, 1913, hundreds of men, women and children led by Gandhi marched from Newcastle, Natal Colony (now KwaZulu Natal) into the Transvaal to purposefully defy the Immigrants Regulation Act of 1913 (Act no. 22). Gandhi was followed by two parties led by Thambi Naidoo and Albert Christopher. This marked one of the greatest episodes in South African history. He was arrested the following day at Palmford. Prior to this march, Thambi Naidoo mobilised the Indian community at Newcastle to start the Satyagraha Campaign (Passive Resistance Campaign).Gandhi made strict rules for the conduct of the Satyagrahis who were to submit patiently and without retaliation to insult, flogging or arrest. While leading a march on 6 November 1913, which included 127 women, 57 children and 2037 men, Gandhi was arrested. He was released on bail, rejoined the march and was re-arrested. The Indian Relief Bill was finally scrapped. At one time there were about fifty thousand indentured labourers on strike and several thousand other Indians in jail. The Government tried repression and even shooting, and many lives were lost. "In the end", as an American biographer has put it, "General Smuts did what every Government that ever opposed Gandhi had to do - he yielded." A spontaneous strike by Indians in Natal altered the situation radically. Here violent confrontation ruled and several strikers were killed and injured in clashes with the police and more protesters joined. By the end of November 1913 produce markets in Durban and Pietermaritzburg had come to a standstill, sugar mills were closed and hotels, restaurants and homes were left without domestic workers. Reports in India relating the arrest of Gandhi and police brutality caused uproar and the British government was forced to form an agreement with the strikers. Gandhi was released in order to negotiate with Smuts over the Indian Relief Bill, a law that scrapped the £3 tax on ex-indentured workers. The law was scrapped.Gandhi was released and, in January 1914, a provisional agreement was arrived at between him and General Smuts and the main Indian demands were conceded. Gandhi’s work in South Africa was now over and, in July 1914, he sailed with his wife for England. Before sailing, he sent a pair of sandals he had made in jail to General Smuts as a gift. Having spent twenty years in South Africa helping fight discrimination, Gandhi decided it was time to head back to India in July 1914. On his way home, Gandhi was scheduled to make a short stop in England. However, when World War I broke out during his journey, Gandhi decided to stay in England and form another ambulance corps of Indians to help the British. When the British air caused Gandhi to take ill, he sailed to India in January 1915.Gandhi's struggles and triumphs in South Africa had been reported in the worldwide press. By the time he reached home, in India, he was a national hero. Although he was eager to begin reforms in India, a friend advised him to wait a year and spend the time travelling around India to acquaint himself with the people and their tribulations.Yet Gandhi soon found his fame getting in the way of accurately seeing the conditions that the poorer people lived in day to day. In an attempt to travel more anonymously, Gandhi began wearing a loincloth (dhoti) and sandals (the average dress of the masses) during this journey. If it was cold out, he would add a shawl. This became his wardrobe for the rest of his life.Also during this year of observation, Gandhi founded another communal settlement, this time in Ahmadabad and called the Sabarmati Ashram. Gandhi lived on the Ashram for the next sixteen years, along with his family and several members who had once been part of the Phoenix Settlement. It was during his first year back in India that Gandhi was given the honorary title of Mahatma ("Great Soul"). Many credit Indian poet Rabindranath Tagore, winner of the 1913 Nobel Prize for Literature, for both awarding Gandhi of this name and of publicising it. The title represented the feelings of the millions of Indian peasants who viewed Gandhi as a holy man. However, Gandhi never liked the title because it seemed to mean he was special while he viewed himself as ordinary. However other sources claim it was Nagar Sheth of Jetpur, Shri Nautamlal B. Mehta (Kamdar), who was the first to use and bestow "Mahatma" for Mohandas Karamchand Gandhi on 21 January 1915 at Kamri Bai School, Jetpur, India. From then on, Gandhi was known as Mahatma Gandhi. It is commonly believed that Rabindranath Tagore first bestowed the name. However, this is incorrect. On 30 January 1948, Gandhi hurriedly went up the few steps of the prayer ground in a large park in Delhi. He had been detained by a conference with the Deputy Prime Minister, Sardar Vallabhbhai Patel, and was late by a few minutes. He loved punctuality and was worried that he had kept the congregation waiting. "I am late by ten minutes," he murmured. "I should be here at the stroke of five." He raised his hands and touched the palms together to greet the crowd that was waiting. Every one returned the greeting. Many came forward wanting to touch his feet. They were not allowed to do so, as Gandhi was already late. But a young Hindu from Poona, Nathuram Vinayak Godse, forced his way forward and while seeming to do obeisance fired three point-blank shots from a small automatic pistol aimed at the heart. Gandhi fell, his lips uttering the name of God (He Ram). Before medical aid could arrive the heart had ceased to beat.